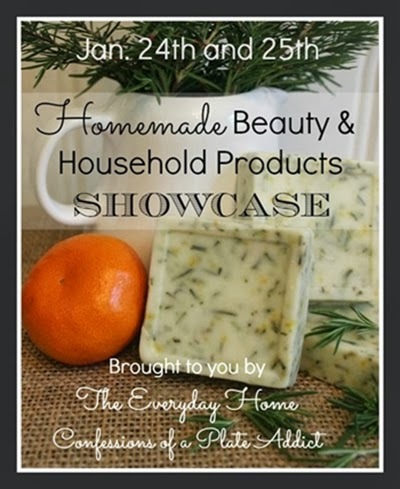 I am excited to join eighteen other bloggers in a fun tour…the Homemade Beauty and Household Products Showcase, where we are sharing our secrets for creating our own products to keep your home fresh and clean and to keep you beautiful! My secret…homemade simmering lemon and lavender potpourri! It’s so easy and inexpensive…and leaves your home with a clean, fresh scent! It only requires three ingredients and a little time. One cup of dried lavender (I used both the leaves and flowers saved from last year’s French lavender.) Place the lavender in cheesecloth if you wish. Add the above ingredients, squeezing the lemons and adding both the rinds and the juice. Allow to boil for a few minutes to release the scent, then reduce to a simmer. In about 30 minutes, your whole house will smell wonderful! You can put it in the fridge and reuse it for several days. Be sure to keep an eye on the water level when the potpourri is simmering. Please note that this is a recipe for potpourri and is not intended as a beverage. In just a short time, your home will be filled with a light, fresh fragrance that will chase away that stuffy winter feeling from living for months with your windows closed! And for me, the smell of lavender evokes memories of a wonderful vacation spent near the lavender fields of Provence! And just in case you missed it, here is the simmering potpourri that I shared at Christmas…a spicier version that leaves your home with that wonderful cozy Christmas smell! However, I like to use it all winter long, too! Finally, add two cinnamon sticks, two bay leaves and 10-15 whole cloves. Place the spices in cheesecloth if you wish. Our Miss Kitty has a suggestion…how about a catnip simmering potpourri? It would bring back memories of wonderful sunny days on the patio…enjoying the potted catnip! Hmmm…I’m not so sure that’s a good idea, Miss Kitty! But I do hope that you will try my recipes and check out the other bloggers to see what they are sharing! Thanks for stopping by! I hope you enjoyed my recipes for simmering potpourri! Please visit these wonderful bloggers and their beautiful blogs to see what they are up to and to find a list of this week’s participants! I'm putting this on to simmer tomorrow Debbie. How divine it must smell. I make my own Christmas simmer pot but this will be lovely all year round. I might try it with fresh lavender... I have a bush full of blooms beside my back door. Thanks for sharing this in the showcase. I'm pinning it now. Lemon and lavender are two of my favorite scents. My lavender died last year and I need to replant so that I can make your potpourri next year. Thanks for sharing! Lemon and Lavender. The perfect combo! Give sweet Baby Kitty a kiss for me!! Love this. Where do you find fresh lavender? We have snow and 0 degree temps. Mine is actually not fresh, but dried from last year's plant. I do have some fresh, however, in a pot in my garage! lol It has survived even though it was 5 degrees last week! I do see dried buds for sale online. Can't wait to put this on the stove. I actually have both main ingredients on hand. My daughter in law ordered lavendar on line to make lavender chicken while they were visiting here this summer and I still have some in a baggie. you had me at lemon and lavender...but vanilla too! Yum. Thanks for sharing. ohhh...I cannot wait to try! This is going to be fabulous! I love lavender. This looks wonderful, I can't wait to try it!! This must be absolutely fabulous! Love both the scents... will definitely try! Such fun being in this showcase with you!! I love this! I want to try it! And your tutorial was just lovely! What a wonderful combination! I cannot wait to try this!